News on our sheep and cattle can be found on our farm blog. Follow our 2011 lambing season and discover pictures of our new arrivals as well as following our livestock through the farming year! For sales enquires please get in touch through the contact us page. Our lambs are born in springtime, as nature intended, with the weather warming up and the first new season grass pushing through, sweet and full of goodness to give the lambs the best start. Our animals mature slowly, for between 6-14months, at grass, giving the meat a distinct depth of flavour and tenderness that distinguishes lamb and mutton produced in the traditional way. Our lamb and mutton is available by the whole or half, butchered to your requirements and delivered to your door. The meat freezes beautifully and all our customers receive a quarterly newsletter with news from the flock and recipe ideas for getting the most from your lamb or mutton. Our Dexter cattle are a very new addition to the farm, arriving in June 2010. Dexters are a traditional breed, originally native to Ireland. They are classed as "miniature" owing to their small stature, and have long been prized for giving some of the finest beef available. Dexters are classified as rare breeds, and ours are a registered pedigree herd. Dexters are a hardy breed and can live outside all year round. We currently have three breeding cows on the farm, and two steers (animals kept for beef). 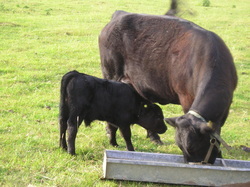 Our first calf to be born on the farm arrived on the 15th January 2011, we have named her Poppy. Two more calves will follow, all being well, in July. Our beef steers will be kept to 30 months to give mature, marbled and full flavoured meat. Are cows live outside at grass and are not fed concentrates, instead grazing all year round with the access to hay, silage and pea straw in the winter. Our first beef will be available in Summer 2012.